Why mythology as a subject? Over the last several years I have become fascinated with how the goddess stories relate to women I know and to myself; how contemporary these archetypes feel. You go onstage as a powerhouse speaker, concert pianist and as an artist; does anything frighten you? I’m a storyteller, so speaking to an audience is truly delightful. With my art projects, at the halfway point I usually panic a bit that the piece won’t meet my own standards but this seems to be an element of the artistic process. However, just prior to my concerts I do experience moments of stage fright because the level of performance I expect from myself sets a very high bar. Can you explain your art – music fusion philosophy? Synethesia is when sense stimulates another, the most common connection being sound and color. Synethesia is when sense stimulates another, the most common connection being sound and color. Kadinsky, Mondrian, O’Keefe and other artists experienced this as did musicians including Liszt, Beethoven, and Scriabin while composing. It seems I’m in some pretty impressive company because I too see color when I hear music and always have an internal music soundtrack when I’m working on my art. Can you explain this art – music tie as it relates to your new series? Music is my first language since it has been a major element of my life since my earliest years. It feels natural for me to find a piece of music that I love to play to enrich the stories of my gods and goddesses. When did you start performing and how did that come about? My father was a professional jazz musician and my mother was a pianist. I started playing the piano at five and never stopped performing. How do you fit into the SoCal art/music scene? It started with a concert I did to open the recital hall in Barnsdale Park for the Los Angeles Mayor’s office and the Bureau of Music. 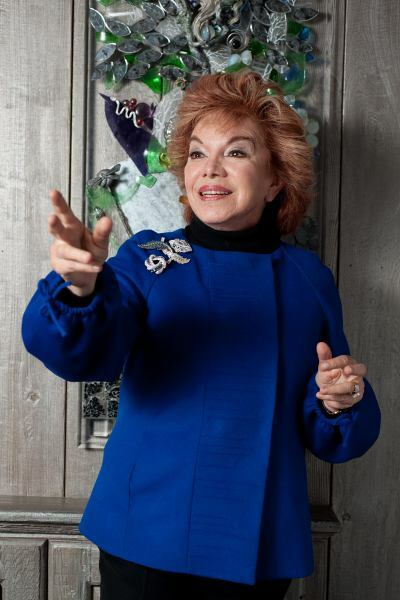 I have served on the boards of the Opera League of Los Angeles, the Los Angeles Philanthropic Committee, Playrights’ Arena, and the Los Angeles Philharmonic Committee of Professional Women, and have performed benefit concerts for all these groups. I have also been on the faculty of the UCLA School of Design as well as the advisory board of the Cal State Design School. Now I’m involved with the Glass Alliance of Los Angeles and support many Southern California art museums. How did you choose glass as a medium? I have always been fascinated with color and reflective finishes; the way light shines through colored glass, especially how shattered glass gives my new prisms to refract and reflect colors. For me this is like finding new musical notes to use in composition. Can you share your secret for lifetime inspiration and creativity? Like Aphrodite, I’m a hedonist. I respond with all my senses. Creative activities like playing music, creating art, and even experiencing nature inspire me. I’m a voracious reader and love to experience new people, locations, and events through travel. How did the transition into art happen? I have always been fascinated with color and reflective finishes; the way light shines through colored glass, especially how shattered glass gives my new prisms to refract and reflect colors. For me, this is like finding new musical notes to use in composition. I’ve always had art projects in process but until recently they were secondary to my music. It has been fantastic for me to have the time and resources to devote full time to music and art at the same time as I discovered how to use shattered glass to “reflect” the colors from my life and dreams. Who or what was your original inspiration for your Glass Art? Frugality and a natural disaster were the real inspirations for the Glass Art. Following the Los Angeles earthquake I had many broken glass artifacts and even some designer liquor and perfume bottles. My first thought was to restore the crystal, vases and such but when I incorporated pieces into my art I was inspired into this new direction. Can you tell us about your new book Art of Myths and Music (Sutton Hart Press)? Coming soon is a coffee table book with photographs of my Olympian glass series accompanied by stories the myths I have illustrated with each piece. We are planning a sensory mix of beautiful paper, striking images, and sensory music to tie this all together. We’ve heard you have played some special instruments; can you tell us about that? In my travels I’ve been invited to play some famous pianos in well known venues. Among them are several of Franz Liszt’s pianos at his home in Budapest, his Steinway from his Bellagio home at the La Scala Opera Museum, and Edvard Grieg’s Steinway at his home in Bergen. 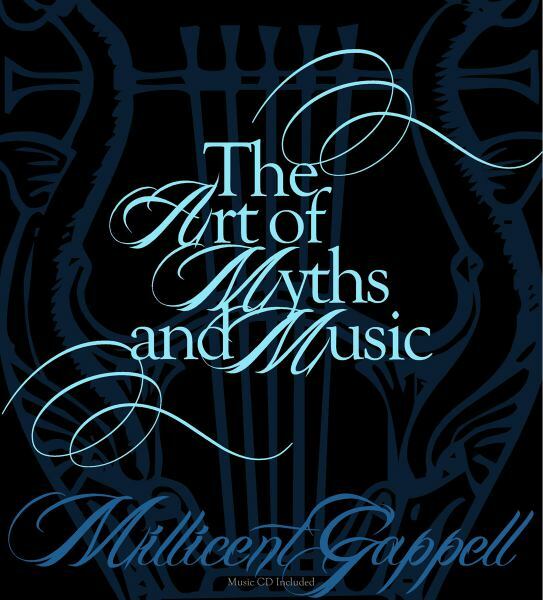 Millicent Gappell’s pathway to prominence in the arts is built on a musical foundation as a concert pianist, a pioneer in the philosophy & science of color and design, and her groundbreaking Myth Collection. Millicent is a leading American glass artist and performing pianist. Her new book Art of Myths and Music (Sutton Hart Press) is scheduled for an early 2011 release with a West Coast book and performance tour.